Griswold cast iron works started producing hinges and stove accessories in 1865. They expanded into the best cast iron cookware in the 1870s. The facility was built in Erie, Pennsylvania, and the earliest pots have Erie stamped on the bottom. If you find a Griswold cast iron skillet with the word ERIE printed across the base, you may have stumbled upon a highly valuable piece of history. In addition to the ERIE logo, you’ll find a “spider” structure on the pan. The spider structure refers to short legs on the bottom of the pan so it can sit both on the cooktop and in coals. Later pieces of Griswold cast iron history feature a diamond shaped logo on the bottom. The word ERIE is still included inside the diamond. These skillets were produced from 1884 to 1909 at the Griswold Erie PA ironworks. They are less valuable than the earlier pieces, but still highly sought after. The most commonly known Griswold logo features a cross with a center circle that includes the name ERIE. Later pieces also included the word GRISWOLD printed in block letters. If you’re looking for value in the collector’s market, seek out pans with the largest Griswold stamp logo you can find. The 4-inch logo with the cross pattern is highly sought after. Griswold cast iron was some of the finest produced in the United States. The fact that it’s still usable to this day demonstrates the high quality of this product line. Experts warn against purchasing any pans produced in the 1950s. When Wagner Cast Iron bought the Griswold facility and name, the pans were no longer made in Erie and quality was greatly reduced. Experts with Cast Iron Collector offer a detailed listing of what pans were made in certain eras, and which logos were used as the years went by. The value of Griswold cast iron is quite easy to determine if you can confirm that the pans aren’t knock-offs – a bit of study can help you determine the value of the pan in your sights. If you’re lucky enough to find any Griswold cast iron griddle or pan that still has the spider legs or the logo visible, it can be a great purchase. 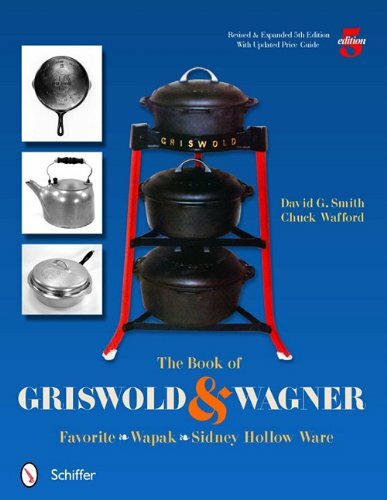 Why Is Griswold Popular Among Collectors? One of the main reasons that Griswold is so popular is that the items are quite easy to date. The breakdown of when logos changed is easily traceable and a dedicated collector can quickly determine the age of a Griswold cast iron pan. Whether collectors plan to display the pans or cook with them, they can be assured that this cookware can be put back to work. It may need to be cleaned up and seasoned, but once the work is done you’ll have a great tool that’s easy to cook with. Of course, depending on where you’re buying your antique cast iron, pricing guides are generally just a useful suggestion. An antique skillet from the early days of the Griswold iron works can be marketed for more than $3,000, depending on the condition and traceability. The early Griswold pans weren’t bought with an eye for provenance, but for practicality, so you may not find papers backing up the original purchase date. It’s critically important to study the visible surface and to look for the spider feet built into the early pans. Finally, collectibles expert Tony Hyman reminds us that each piece, depending on the condition, will need to be separately assessed and priced. His strongest piece of advice? If you can’t cook in it, it’s not worth much as a collectible. Always check pieces for deep pitting across the bottom (an indicator of damage by extreme heat) and cracks. Do you want to use it or hang it? The joy of cast iron is cooking with it, so make sure the piece you discover can be utilized. Keep reading to discover a simple tip to check if a pan is cracked. In addition, modern-day cast iron tools are often sand-casted, rather than mold-casted. Sand cast pans are inherently rougher and much harder to season smoothly. Modern cast iron can be a lot heavier than antique cast iron. For a really smooth piece of well-seasoned cast iron, a Griswold waffle iron or Griswold skillet can be a lot easier to maneuver and very nice to use. Weight is a good test to determine that you have an authentic antique piece of cast iron. Modern cast iron is thicker and much heavier than antique mold-cast iron. A new 9-inch skillet is much harder to handle than an antique of the same size. For comparison, see our best cast iron skillets guide to explore other brands and options. 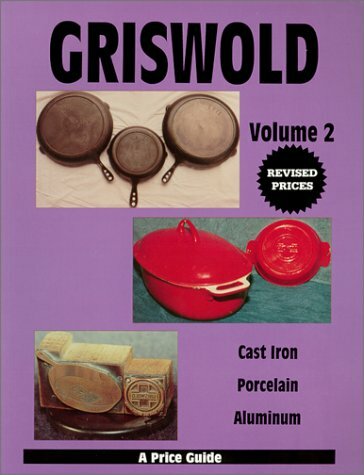 Curiously, there are three iron skillets originally manufactured by Griswold that are not valued as collector’s pieces due to the volume of their creation. These are the skillets numbered 3, 6 and 8. These were all a piece from the newlywed’s starter cookware set. The most valuable item to date is a number 1. This number refers to a 4-inch skillet sold as a toy. While you can cook in it, keep in mind that in good condition it’s valued at over $1000. When searching for old cast iron, you should check out old junk shops, out of the way antique dealers and other knick-knack type spaces. Check the bottom of the pan for a manufacturer’s name and any other markings which can help you date the product. While you’ve got the pan flipped over, experts recommend rapping the pan sharply across the bottom. If you hear a clear bell tone, the pan is more than likely whole. Should you notice a dull clunk, the pan may well have a crack – not all of these defects are visible. However, a cracked pan is doomed if you plan to use it and is not a wise purchase for a collector. In addition to a crack, you may notice pitting across the bottom and against the inside edges. While a bit of pitting is not a deal breaker, it may be an indicator of heat damage rather than just an uneven seasoning or burned oils built up over time. Lye can be used to strip away the old seasoning on your classic cast iron. Take care to take extreme safety precautions when working with lye. Soap makers recommend long sleeves, heavy shoes, goggles and gloves. Lye burns are not something you wish to experience. The video below offers some great insights for salvaging old cast iron. While a collectible pan can be wonderful fun to own, the fact that these pans survive as long as they do is a testament to the skill that went into making them. It doesn’t have to be a valuable antique to be a wonderful kitchen tool. Why Does Cast Iron Stay So Popular? Cast iron cookware can be used on so many cooking surfaces, from induction and outdoor grills to a rustic campfire. While stainless steel pans lined with copper or aluminum will transfer heat well and make cooking easy, cast iron not only transfers heat well, but it retains heat, making it a terrific tool for deep frying. If the pan stays hot, the oil stays hot, even when you put cold food in it. This crisps the outside of the food and produces a satisfying crunch. Finally, while non-stick pans may be a favorite of many cooks, it should be noted that well-seasoned cast iron has a great non-stick surface. Take care not to cook acidic foods in your cast iron – this can destroy a well-seasoned surface – and your cast iron will produce baked goods, meats and vegetables for years to come. Investing in antique kitchen tools is a great way to put these durable and wonderful pieces back to work. In a world of quick-cooking everything, there’s joy in heating up oil and frying up a main course in a durable, well-seasoned piece of cast iron. If you find a piece that’s truly valuable and want to display it, take care to make sure it’s well-seasoned and watch out for rust. In all honesty, you may be able to keep the pan in better shape if you just keep using it!